The ruins of an absolutely unique Early Christian church and monastery from the 5th century AD located in an area known as Dzhanavara in Bulgaria’s Black Sea city of Varna have been vandalized by camping and drinking parties, which are not only disrespectful, but also highly destructive for the archaeological site, alarms a local archaeologist. As a result of the camping and drinking parties that keep happening there, the ruins of the Early Christian church have been turned into a dumpsite which the local archaeologists keep trying to clean up the site, archaeologist Vasil Tenekedzhiev has told private Bulgarian radio station Darik. “During the excavations we have found syringes, broken bottles, and other traces of wild parties, which, however, come at the expense of the church ruins,” says the outraged archaeologist from the Varna Museum of Archaeology (Varna Regional Museum of History), who has participated in the excavations of the Byzantine Early Christian monastery complex. He adds that he has witnessed how in daytime camping families set fires right on the spot of the ancient Christian temple‘s altar. Tenekedzhiev explains that unique Early Christian mosaics have been preserved at several spots inside the Early Christian church which have been covered with soil by the archaeologists in order to protect them from today’s campers and party-goers. The Varna archaeologists also keep putting warning signs which keep getting destroyed. The ancient church in Dzhanavara dates back to the 5th century AD; it was part of a large Byzantine Early Christian monastery complex located on the outskirts of Varna’s suburb Asparuhovo, about 5 km away from the fortress walls of the Ancient Thracian, Greek, and Roman city of Odessos. The Early Christian church and monastery in Dzhanavara is very important from an archaeological point of view because it provides a lot of information about the history of the ancient Black Sea city of Odessos (known in Roman times as Odessus) and of Early Christianity. The monastery was inhabited by Christian monks, and since its architecture and mosaics are not typical for the Balkan Peninsula but resemble some similar sites in the easternmost provinces of the Roman Empire, it is believed that it was founded by a group of Christians who came from the Middle East. The Early Christian monastery near Odessos existed for about 2 centuries; it was destroyed in the barbarian invasion of the Avars and Slavs in the early 7th century AD. It was first excavated in 1915 and 1919 by Czech-Bulgarian brothers Karel and Hermann Skorpil, the founders of modern-day Bulgarian archaeology, who found three reliquaries – a golden, marble, and silver one – placed one inside of the other, which contained relics of an unknown Christian saint. The untypical architecture and the 100 square meters of preserved floor mosaics make the church and monastery near Bulgaria’s Varna unique in the history of Early Christianity. According to archaeologist Vasil Tenekedzhiev, the plot on which the Early Christian monastery complex is located is part of the State Forestry Fund which leaves it without the status of an archaeological site. This does not allow the enclosing and security of the archaeological site, and also precludes the local archaeologists from applying for excavation funding from different sources. The administrative procedure for granting the Early Christian monastery in Dzhanavara a protected status was started two years ago but has not been completed yet. As a result, the local archaeologists have been using the most basic method of protecting the archaeologist monument – reburying it in a careful way. Tenekedzhiev also says that the site has a great potential for cultural tourism, and that tour operators keep expressing interest in organizing visits. However, the most interesting features of the Early Christian complex remain hidden, and its appearance is disappointing for the tourists. In his words, if the site is granted a protected status in 2015, in 2-3 years it can be fully excavated, rehabilitated, and exhibited in situ as a “Museum of Early Christianity”. According to the experts from the Varna Museum of Archaeology, this can be achieved by constructing a protective structure over the site, unearthing the Early Christian mosaics, and exhibiting the underground space where the Skorpil Brothers found their reliquaries 100 years ago. What is more, the site is located right off the highway between Bulgaria’s largest Black Sea cities, Varna and Burgas, and is very accessible for visitors. The unique Early Christian Church and Monastery Complex located in the area called Dzhanavara in the Bulgarian Black Sea city of Varna dates back to the 5th century AD. It is located 5 km away from the fortress walls of the Ancient Thracian, Greek, and Roman city of Odessos (Odessus), today’s Varna. It existed for about 2 centuries having been destroyed in a barbarian invasion of the Avars and Slavs in the early 7th century AD. 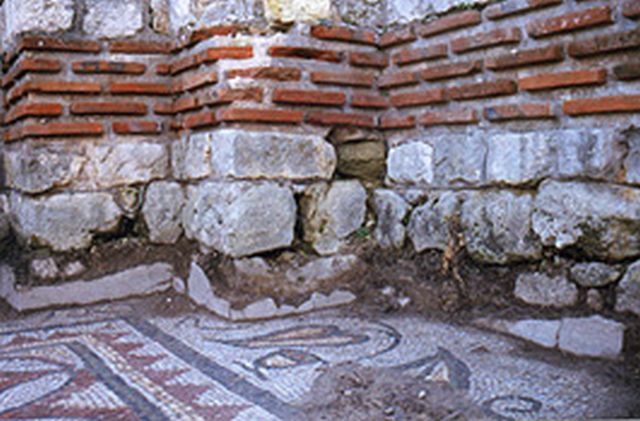 The architecture and mosaics of the Early Christian church are untypical for the Balkan Peninsula but bear some resembles to monuments in the easternmost provinces of the Roman Empire leading Bulgarian archaeologists to hypothesize that the Early Christian monastery was founded and inhabited by monks who came from the Middle East. The church itself was 31 meters long and 28 meters wide, and the walls of its naos were 2.5 meters thick. It was built of layers of stone blocks. 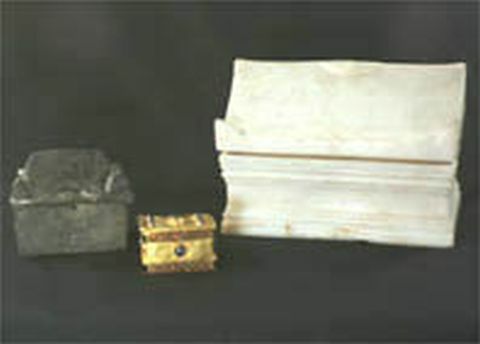 Under the church there was a man’s brick tomb where three reliquaries – a marble, silver, and gold one – containing the relics of an unknown Christian saint were found. This discovery was made in 1915-1919 when the Early Christian church near Odessos (Varna) was excavated by the Czech-Bulgarian brothers Karel and Hermann Skorpil, the founders of modern-day Bulgarian archaeology. The site was further excavated by Bulgarian archaeologist Alexander Minchev and Vasil Tenekedzhiev from the Varna Museum of Archaeology (Varna Regional Museum of History) in 1997-1999 when they uncovered household structures proving that the church did not stand by itself but was part of a monastery complex. As of the spring of 2015, the unique Early Christian church and monastery are part of Bulgaria‘s State Forestry Fund, and have not been granted a protected status; their ruins have been used by locals for camping and drinking parties. Local archaeologists in Bulgaria’s Varna hope to be able to complete the excavations and turn the site into a Museum of Early Christianity. The site contains about 100 square meters of preserved Early Christian floor mosaics which have been reburied by contemporary archaeologists in order to protect them.